Tom Steels of Belgium raises his arms as he crosses the finish line to win the third stage of the Tour de France cycling race from Nantes to Laval, western France July 6 1999. 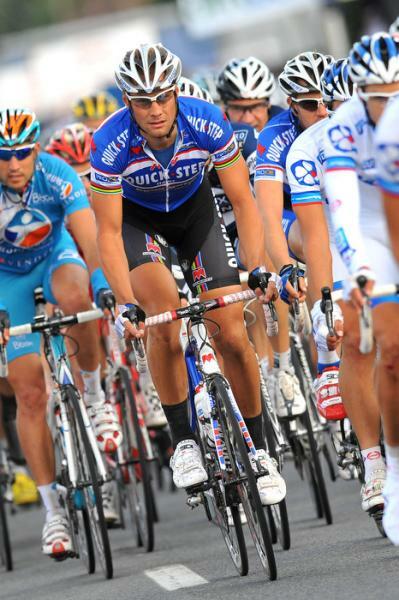 Team Quick Step is happy to announce that they’ve reached an agreement with Tom Steels for the 2011 season. He’ll sign on as a trainer while also following riders from the team’s car as sports director in some of the races on the international calendar. Tom Steels was a Belgian professional road bicycle racer, specialising in sprint finishes and one-day races. He was one of the top sprinters in the peloton. His best season was 1998 when he won the national championship for the second time and returned to the Tour de France to win four stages. He was also national champion in 2002 and 2004 and won five more stages in the Tour. 2006 was his first year as a professional that he failed to win a race. Bad weather and hazy evenings can be overcome by a good session indoors on a turbo trainers. 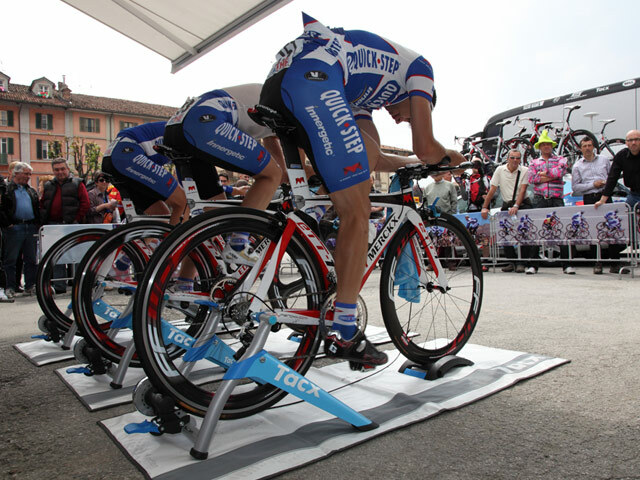 The basis idea of the turbo trainer is to provide a stationary support via a folding ‘A’ frame. The bike’s rear wheel is then clamped (over the quick release lever) into the frame and the roller is usually pressed up again the rear tyre. The turbo trainer is ideal for high quality 20-60 minute work outs, raising your heart-rate to higher levels for fitness gains and to develop cycling-specific muscle. Do not attempt to replicate a long ride on a turbo trainer – you will become very numb and very bored. Concentrate on good quality exercise – most of your sessions will be in Zone 3 to 6. Leg speed intervals: Leg speed intervals are best executed in a moderate gear and will improve your lactate threshold, cadence and ability to repeat high-speed efforts. Accelerate in the saddle and maintain a high cadence (around 100 to 120 RPM) for a minute before recovering for a minute. Power sprints: These sprints aim to produce explosive speed as needed for any sprint situation. Accelerate in a big gear as hard as you can for 10 – 15 seconds. Allow yourself time to recover and repeat this 6 – 8 times. 30-Minute Time Trial: Your objective is to hold your sustainable zone 4 pace for the duration of this ride. Part of the training is learning to pace yourself to ride a steady and sustainable pace for the duration of the time trial. Increase your pace to zone 4 and hold it for 30 minutes. Avoid getting to fast at the beginning. Use a heart rate monitor or power meter to judge your effort. If possible, record your speed and HR/power during this session and compare it to another 30-minute time trial to determine if you are able to ride faster at a similar HR or power. Recovery spin: Purpose of recovery spin is to loosen up stiff, sore legs and to circulate blood to flush out waste products. This should be ridden in low gear with less resistance at a fairly high cadence (85-100RPM) It should feel as though there is no pressure on the legs. Total workout length 30-45 minutes. The peloton in full sprint with 100m to go. Today the peloton started in the Sluitingsprijs Putte-Kapelen, the traditional final race of the Belgian cycling season. A five man lead group dominated the race, but in the eleventh and final local lap they were caught by the peloton. So a bunch sprint had to bring the decision in this last Belgian race of 2010. Wouter Weylandt was looking for another win, but he was beated by Adam Blythe. Weylandt had to be satisfied with a second place. The race was also Tom Boonen’s final race of a troubled 2010 season. The Quick Step team leader has opted not to ride the Giro del Piemonte on Thursday and will now focus on completing his rehabilitation treatment on his knee. Belgian rider Nikolas Maes dominated Paris-Tours with a long breakaway. Together with Saramotins, Flecha, Pichon, Jorgensen, Meyer, Krivtsov and Geschke he was in the front for a long time. The eight escapees took a maximum lead of 4 minutes, but the peloton kept them under control. After 203,5 kilometres Geschke attacked on the Côte du Crochu, Maes was the only one who could follow him. They took a small lead, while their former companions were caught with 20 kilometres. Five kilometres later Maes and Geschke were caught also. The peloton prepared itself for a bunch sprint then, the last one on the Avenue de Grammont. The planned tramway will relocate the finish before next year’s race, making this edition the last to use the classic finish line. In this year’s bunch sprint the Spaniard Freire took the win in front of Furlan and Steegmans. Wouter Weylandt finished the race in 8th place. Italy’s Dario Cataldo (Quick Step) won the GP Beghelli race in Italy with sprint that left his rivals distanced by several bike lengths. Cataldo gave Team Quick Step a beautiful victory in the GP Beghelli. Cataldo was the strongest in a group sprint after 198 kilometres. The 25-year-old Team Quick Step rider edged out a small group of about 15 riders in a final sprint, after the group broke away from the peloton on the Zappolino slope, around 5 kilometers prior to arrival. Cataldo started the sprint early, but managed to fence off attacks from Jacob Fulgsang and Daniele Pietropolli, edging them out on the Monteveglio finish line. At the podium in Monteveglio Cataldo was accompanied by Fuglsang and Pietropolli. Team QUICK STEP will be working on several fronts during this weekend of races. In Italy the riders from the Belgian team will be lining up for the start of the Giro dell’Emilia on Saturday the 9th, and for the GP Beghelli on Sunday, October 10th. Meanwhile, on the same Sunday in France, QUICK STEP riders will be busy in the Paris-Tours, the Classic dedicated to the fastest wheels from the group. Riders: Tom Boonen, Sylvain Chavanel, Kurt Hovelijnck, Kevin Hulsmans, Nikolas Maes, Andreas Stauff, Matteo Tosatto, Wouter Weylandt. Riders: Dario Cataldo, Dries Devenyns, Addy Engels, Mauro Facci, Branislau Samoilau, Kevin Seeldraeyers, Thomas Vedel Kvist, Marco Velo. D.s: Davide Bramati & Luca Guercilena. He was close in the third stage in the Franco-Belge with a second place, today Wouter Weylandt took revanche and won the final stage of this stage race. In the stage to Tournai Weylandt was involded in an early escape group, with also Tom Boonen involved. Their attempt didn`t succeed, just like other breakaways was neutralized by the bunch. In the group sprint former Quick-Stepper Steegmans launched the sprint from far, but Weylandt overtook him and gained his sixth win of this season. Tom Boonen (Quick Step) is racing for the first time since June having recovered from a knee injury. Is he on his new EMX-7? The world championship course in Geelong was tailor-made for Tom Boonen. Unfortunately the Belgian sprinter missed out on the chance of winning a second rainbow jersey because he is recovering from a knee surgery. Boonen won the Worlds title in Madrid in 2005 on a similar course. “You only get two or three chances in life to be world champion. This was perhaps my second,” Boonen admitted told Sporza. The QuickStep rider didn’t watch much of the race, as he was riding in the Circuit Franco-Belge. “I only saw the last two kilometers. And then the rebroadcast. I’m not an early bird!” he said. The Belgian said that he was happy for new world champion Thor Hushovd. “He deserved to be world champion. I had already seen that he looked very sharp in training.” Both riders live in Monaco, and Boonen expects to congratulate Hushovd for his win there, later this week. The short French-Belgian stage race was Boonen’s first competitive race since the Tour de Suisse in June. Although the first three stages ended in mass sprints, he did not participate in any of them and he did not start the final stage.